Berkeley Repertory Theatre, Berkeley, Calif. If there is a problem with the new production at Berkeley Rep, it may be the one about too much of a good thing. There is a lot to be admired in Tony Taccone’s re-imagining of the inner life of Jonathan Moscone following his father’s assassination. The performers, many of whom were in the play’s debut at Oregon Shakespeare Festival last summer, are fine and sensitively directed by Moscone himself. The story, incorporating the details of San Francisco Mayor George Moscone’s death back in 1978 at the hands of a disgruntled city supervisor who went on to kill fellow supervisor Harvey Milk, is as riveting as anything you might see on television — and all too horribly true. The script is alternately funny, insightful, touching and genuinely scary. And much too long. Taccone, much as he did with Rita Moreno’s recent show at Berkeley Rep, seems reluctant to leave anything out, going over the same ground again and again. This is a promising play in dire need of a ruthless editor. It seems that Moscone Junior, who developed the show with Taccone, spent more than 30 years repressing his feelings about his father’s death. In the show, he is a teenager, home sick and watching a television set that delivers the news. Not conducive to healing. For years, Jon (played by Tyler James Myers as a shy, reclusive boy) wonders if perhaps he wasn’t sick enough. Maybe if his father had stayed home with him instead of going to the office… but we won’t go there. Pushing down his grief, the boy grows into a man — a gay man who drinks a bit, pops pills, talks a mile a minute, has trouble with relationships — including with his family — and, we soon see, is haunted by ghosts from the past. He is now played by Christopher Liam Moore, who originated the role in Ashland, Ore. The story becomes that old one about ignoring emotions that only come back to bite you in the rear end. Taccone even has one of the characters, Jon’s best friend, Louise (a very good Robynn Rodriguez), say just that. Not necessary if you give the audience a little credit for brains. As the specters proliferate — a prison guard played with amazing menace by Bill Geisslinger and some kind of police officer/soldier/guardian angel portrayed by the stentorian-voiced Peter Macon — Jon’s defenses begin to crumble. 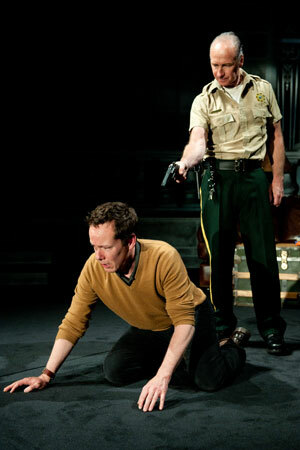 (It doesn’t help that he’s working on a production of “Hamlet,” which features the ghost of a murdered father). He finally collapses in a full-blown episode, which, with Louise’s loving help, leads him to confront and exorcise his demons. Along the way there’s some pretty funny stuff: a scene in a bar that shows that it’s much easier for some people to connect on the Internet than in real life; an audition for the ghost of Hamlet’s father that handily sends up a great many theatrical types; a scene on the set of the movie “Milk,” for which Jon has been asked to consult, with Peter Frechette, terrific as a slightly loony but still hard-headed director. Toward the end (a little too sentimental, a little too unsatisfying), it seems we’ve eavesdropped on just about everything in Jonathan Moscone’s life and mind. Whether it’s all true, only he and Taccone can say. Nevertheless, it’s still too long.